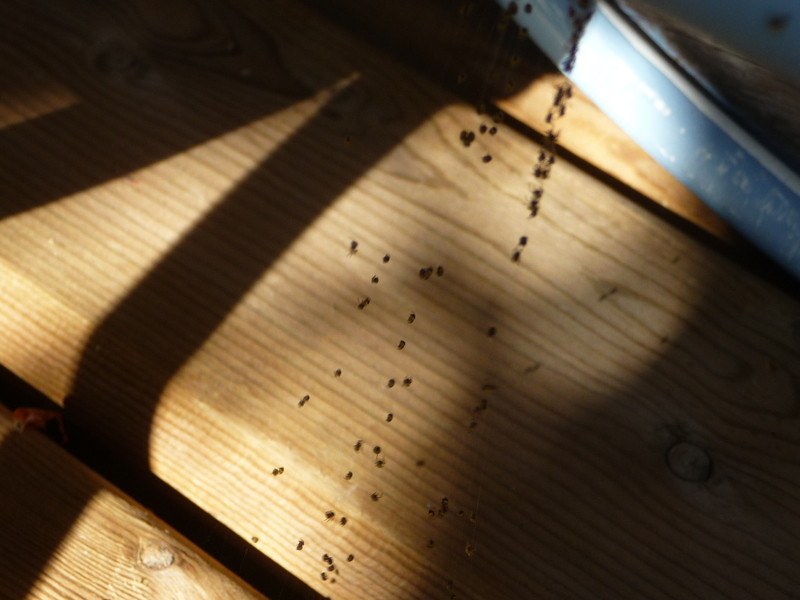 We were on the deck, enjoying a glass of wine in the late dappled light of June, when John noticed that hundreds of tiny spiders had just hatched on the underside of a (much-repaired) table against the side of the house. What kind of spiders are these? I have no idea. No sign of the parents, who might resemble something in the Audubon Field Guide to Insects and Spiders I keep on my desk. These are the size of the head of a pin, golden and brown. When I blew gently on the mass, a whole lot of them drifted down on strands of silk. 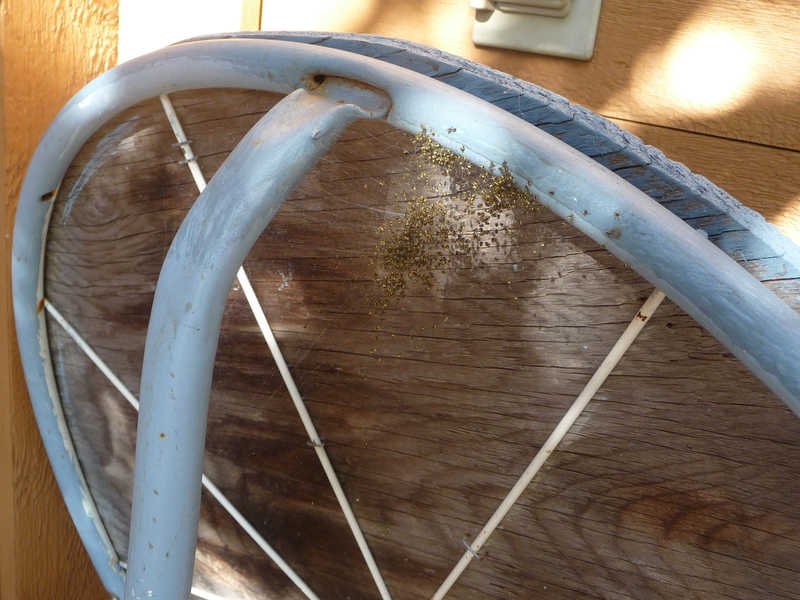 Though we didn’t see the mother who’d prepared the sheets of silky material where eggs were laid in a sac and developed, it was strangely moving to see the spiderlings drift down to the wooden deck board, the earliest to leave, while the others stayed close to the underside of the table where they’d hatched without us ever knowing. I thought of Walt Whitman, much in our minds these days as we remember his poems about grass and the dead and the soul and yes, spiders. ~ by theresakishkan on June 18, 2014. 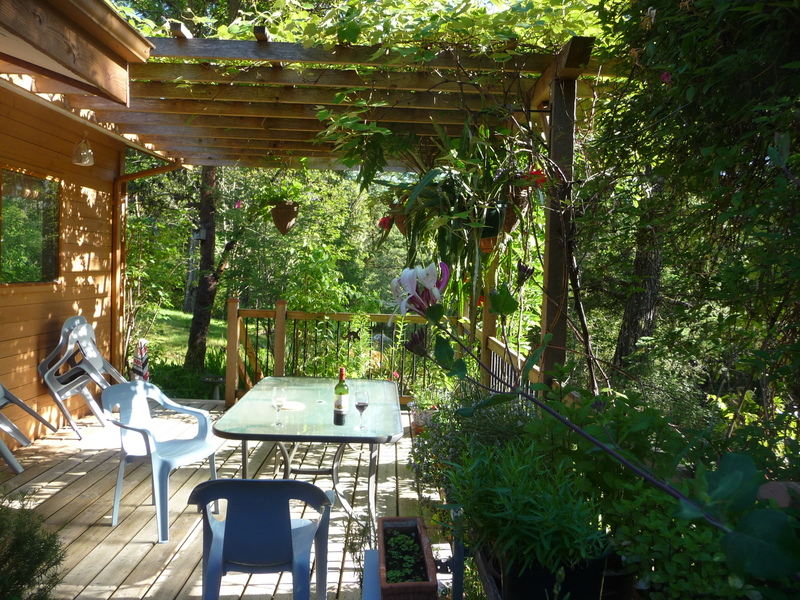 Thank you, Theresa – as I drink my own glass of wine and check out the spider webs decorating my Toronto ceiling, I relish this beautiful poem and your pictures. It’s easy to forget how amazing Whitman was (is) and I’ve been reading him to remember. This entry was posted on June 18, 2014 at 1:29 am and is filed under Uncategorized.You can follow any responses to this entry through the RSS 2.0 feed.You can leave a response, or trackback from your own site.